On this page I would like to explain about the Sunflower and how it connects us Earthlings, among other things, to Sirius, the Fibonacci numbers, the Phi factor (= the Golden ratio), the e factor (the Natural Logarithm) and the Pi factor, but above all, it shows us Unity! More on that later. The reason for picking the theme of this website was not done without a purpose, for it has been done by a grounding and founding reason, for it is a major sacred geometric form, I wish to speak of today. I will give in short little introductions, of the numbers found in it, but it is more important to speak of its Unity factor. First of all, the Petals. All the Sunflower ever does is reach out towards the Sun, towards the Light of it, to warm its petals and flower in the Sun, which brings its Light and warmth to shine the Sunflowers beauty, for us, but also for the animals that feed and live on it, like bees, butterflies and other insects that depend on it. This not solely is true for just the Sunflower, it is of course true for many flowers, but the Sunflower has a more sacred meaning, as we will speak of the sacred geometry of it. The confederation of Galactic families, is the reason I also use the Sunflower for this website. Why? I will explain. The confederation of Star systems are mainly a joined-venture of many enlightened Star systems, who have joined forces together to help other evolving systems, like our Solar system. Each petal of the Flower, represents a member of this venture, of this cooperation, as each petal holds its knowledge within the confederation. Each petal has knowledge which is extremely valuable to be heard and understood. All together they form the knowledge to make help go where it is needed. Each Channeler should realize from which petal it has connections and each Channeler should realize it is not she or he, that holds the knowledge for all, including myself, as writer of this website. We are all part of the Sunflower, so approach yourselves humbly. The funny thing of the Sunflower is that it is a plant which shows us all the irrational numbers and geometry that are connected to irrational behavior. For our, ahem, rational minds, it shows us that there is something else beyond the rational thought process of 3D world. So these irrational numbers, what are they? An irrational number cannot be written as a simple fraction. They are what we know now as the numbers: phi, pi, e and the Fibonacci sequence. All of these can be found in the Sunflower. So the Sunflower urges us to look at the irrational side of Life, towards the side we never tend to look at, or the side we humans often tend to say of, it does not exist. We are called by the Sunflower to look again, and look deeper, for there is more under the skies, star systems and heavens of Source. It left us all these clues to dive into. The Sunflower is among the important ones. Now these numbers can be found within the form of the Sunflower. The rotation of the Sunflower's spirals are in fact connected to the Fibonacci sequence. This means it can be 1/2, or 3/5, or 5/8. Pi is the number related to circles, its number being 3,141592654...etc. It is best known among souls of Earth as we all have had teachings on school on this constant. The number Pi is the mathematical constant, of the ratio of the circle circumference, to its diameter. The e number is a mathematical constant that is used as the natural logarithm. It is equal to 2,71828...and when one would try to approach its limit further, its n factor would become close to infinite. The e number is named after the Swiss scientist Euler, also some call it Euler's number or Euler's constant. It has an exponential function. The most know this Phi factor from as the Golden ratio. It's number comes close to 1,618....The number is based upon the fact that, the longer part's length, divided by the smaller part's length, is equal to the total length of both, divided by the length of the longer part. Its factor and number will be 1,618. This number and factor was known to the Sirius star family and given or passed on to the Egyptian souls. Its pyramid is known as the Golden pyramid. The Egyptians used this symbol as a hieroglyph, for the family they knew, that came from Sirius star system. I will speak more of this in the Ruba messages on Sirius and its knowledge. The pyramid you see below is the Golden pyramid, which holds the Golden ratio, spiraling like a Solar system. Above you will see the hieroglyph the Egyptians used for the Star system of Sirius. It has the golden pyramid. As some of you may not know, it is also connected to the pentagram, a symbol which was of old times, connected to witchcraft stuff. I believe it has deeper knowledge than that, its sacred geometry is certainly not in relation the supposed darkened energies used with it. It is a twisted view of its sacred geometric shape. The five lined Star symbol is connected to this pentagon shape. What we should not be doing is using the top eye pyramid shape of a system, which is used on Earth now, which you will read about in the Ruba messages. That energy is of control and power, not of stability! Only the mitha ajun gives stability. Most importantly, I would like to speak of the Unity which the Sunflower represents. There are two stream of 3D duality in the Sunflower my friends, it holds the feminine and the masculine chakra flows in one flow in its Flower and seeds! As most spiritual souls know, the flow of the energy of masculine and feminine is counterbalanced, flowing in the opposite direction of the other's flow. Here we can see the Ida and Pingala flow around the Ki/Chi tube, and flowing through the chakra system. The picture below is the old chakra system flow, where Ida is the female flow and pingala the male flow. We will follow upon this more below. The Sunflower is a beautiful Flower to watch as it combines both flows of the masculine and feminine in One. This we need to look at more closely, as it is what humans should strive for to become within themselves, Unity flow, by combining both flows in one harmonious flow. The chakra wheels of our energy bodies move accordingly, when you are female, your body automatically knows the female stream better, as it is more dominant. Each wheel of energy (chakra) it passes it will flow that wheel according to your flow, be it feminine or masculine. The Sunflower shows us we must strive to become both in one flow, the BE unity ourselves, to discover both flows within ourselves, to be the balance of the feminine flow and masculine flow within us, the BE whole. As we have shown on Lovehug and via the messages given by many guides, beginning with JIS and Ashtar/Sesherat, the Heart is the center to awaken us into this unity flow, as it is the center and core of that system of flow. When one starts using this important center, we begin to flow our Ki/Chi (energy) flow as One. Our Star families have again and again shown us the importance of all these flows and all these sacred flows, together with Mother Gaia, by showing it to us in the fields of the crops we grow every year. Each circle always shows us important geometric forms, symbols or sequences. It up to us HU-mans to listen, read, learn and decipher each meaning. 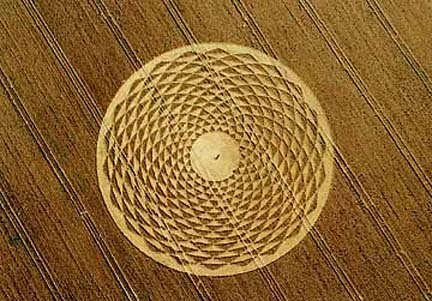 Here is a crop-circle teaching us about this Unity of the Masculine/Feminine flow, of the Sunflower and therefore us, as HU-mans. We are all children of the Sun, living on Earth, living in its Solar system, living to the example of the living Source of All things. When we look at our Sun, we will see the reflection of Source. I ask all of you to BE and Act in the way of the flow and shine of the Sun and of Source divine, as the Sunflower teaches us the become Unity flow and Unity shine, for in that we way we can make a strive at reaching the heavens we seek, within us and around us. Let us transform this world and become the Sunflowers and Stars, we know we already are!